Crazy but adorable puppets, Charlie the Monkey and Max the Max Dog are always a big hit with children of all ages. Invite Charlie the Monkey and Max the Magic Dog along during the break for refreshments Charlie will say "hello". 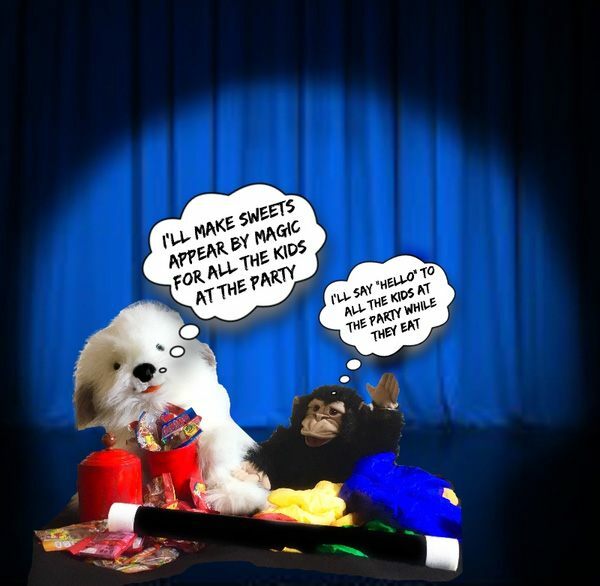 Max makes his appearance in the magic show and will be creating absolute mayhem as he tries and finally succeeds in producing sweets for all the children at the party... by MAGIC! Charlie and Max have been to 1000's of children's birthday parties across Birmingham, Wolverhampton, Kidderminster, Worcester, Stourbridge, Solihull and Kidderminster - make yours the next party they entertain at. Max and Charlie are Crazy but adorable puppets that children of all ages will love and have been avorates in Andy's Magic shows for over 25 years now! Andy the Magician, one of the best children's entertainers and magicians in Birmingham, Bromsgrove, Worcester, Solihull, Kidderminster, Worcester and surrounding area's, will keep the kids entertained and laughing all the way. So please invite them to your birthday party or event, they'd love to see you. Charlie the Monkey and Max the Magic Dog are suitable for the younger age group (2 - 6 years only). Especially good for: Schools, Nurseries, Playgroups, Mother and Toddler groups and birthday parties etc. Alvechurch · Bewdley · Birmingham · Bridgnorth · Brierley Hill · Bearwood . Bromsgrove · Cradley · Droitwitch . Dudley · Evesham · Hagley · Halesowen · Hereford · Kidderminster · Kings Heath · Kingswinford · Ludlow · Malvern · Moseley · Midlands · Northfield · Oldbury . Pershore · Penn · Ludlow · Redditch · Shirley · Solihull · UK · Stourbridge · Selly Oak · Stourport · Tembury Wells · Telford . Walsall · West Bromwich · West Midlands · Wolverhampton · Worcester · Worcestershire · Wordsley · Wall Heath · Quinton . Yardley and all surrounding areas.